Kanopé - Proludic UK - High Quality Play Eqipment! The Kanopé product range invites users to live the adventure at the heart of the forest, thanks to structures that have the appearance of wild grass and tree trunks. The play elements are installed at ground level and the first platforms are 1,17m high, enabling easy access for younger children from 2 years onwards. Older children prefer the treetops, and can climb up to 1,77m on the high platforms. The pathway through the structures can be horizontal or vertical, sometimes steep and unstable. It’s fun for children to climb and go up the multiple ropes. They play and can become acrobats or tight-rope walkers. Sliding could not be more fun with 3 options: the ropes, the traditional slide or the Speed Slide. 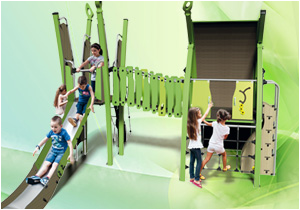 Children can enjoy every play feature within this streamlined and modern design. The shapes, materials and colours reflect moving wildlife. The green arched posts simulate grass leaves or tree trunks. The green and oak-tree coloured signs, arched or cut out, replicate everything that the forest can offer. Multiple ropes bring transparency and movement to the area. The materials chosen (compact panels, painted steel posts with a rotomoulded polythene leaf on top, stainless steel tubes) ensure a durable and resistant product range.